"The defending champions are trading at [1.63] in the Premier League Winner market, ahead of Liverpool at [4.4] who play at Crystal Palace on Monday night." 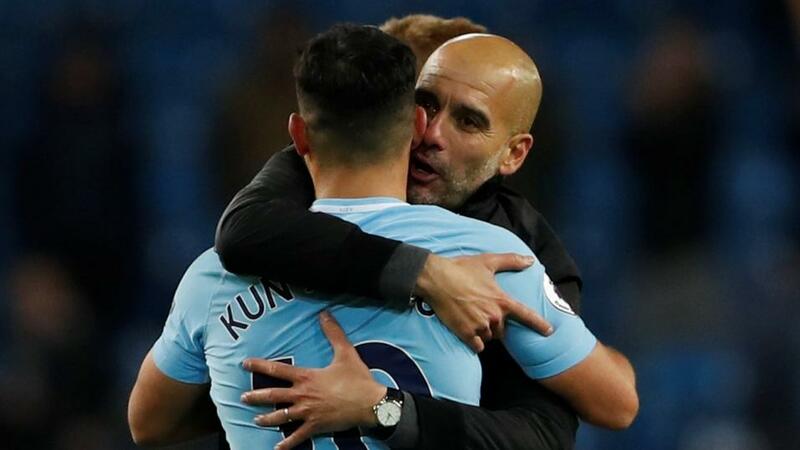 Defending Premier League champions Manchester City have returned to the top of the table after thrashing Huddersfield 6-1 at the Etihad Stadium on Sunday afternoon. Already without the injured Kevin De Bruyne, City boss Pep Guardiola surprisingly left all of Raheem Sterling, Riyad Mahrez, and Leroy Sane on the bench for the game against the Terriers but it mattered not one bit. A hat-trick from Sergio Aguero - his 13th for the club - and goals from Gabriel Jesus and David Silva, plus an own goal, sealed the easy win, meaning City go top of the early Premier League table on goal difference. The defending champions are trading at [1.63] in the Premier League Winner market, ahead of Liverpool at [4.4] who play at Crystal Palace on Monday night. It may have been only their first defeat of the season but the manner in which Manchester United lost 3-2 at Brighton suggests there are some real problems at the club. Jose Mourinho denied any fall-out with Paul Pogba in his pre-match press conference but neither the United boss or Sunday's team captain - who later said, "my attitude wasn't right" - looked at all happy during a very disappointing performance at the Amex Stadium in which the Red Devils' defence looked all at sea. Glenn Murray was first to react to a low cross to put the Seagulls ahead midway through the first half, and just a few minutes later Shane Duffy capitalised on some dreadful defending to double Brighton's lead. Romelu Lukaku reduced the arrears for United, but a converted Pascal Gross penalty after a needless challenge from Eric Bailly restored the two-goal advantage for Chris Hughton's men. Matched at a high of [7.8] to win the game Brighton were rarely in any danger of letting the points slip in the second half though Pogba did score a penalty deep into stoppage time to give the scoreline a little more respectability. After the defeat United - who were generally trading at around [8.0] third favourites for the title before the season - drifted alarmingly in the Winner market, eventually settling at around the [28.0] mark. Along with Manchester City, four other clubs - Bournemouth, Chelsea, Tottenham, and Watford - have a maximum of six points from their opening two games while Liverpool or Crystal Palace can join them should there be a winner in Monday night's game. Chelsea can be backed at [15.0] for the title after their entertaining 3-2 win over Arsenal on Saturday afternoon, while Tottenham trade as the [20.0] fourth favourites after getting the better of newly-promoted Fulham 3-1 at Wembley. Harry Kane scored his first ever goal in the month of August during Spurs' win and after Aguero's Sunday hat-trick there's very little to separate the top three in the Top Goalscorer market; Kane is the [4.4] favourite, just ahead of Aguero at [4.7] and Mo Salah at [5.2]. Bournemouth and Watford are the early-season surprise packages after they maintained their 100% winning starts to the season with away victories at West Ham and Burnley respectively, and as a result both clubs have shortened in the Top 10 Finish market; the Cherries available to back at [3.1] while the Hornets can be backed at [3.4]. Arsenal and West Ham are amongst the clubs with the unwanted record of losing both of their opening fixtures after the Gunners lost 3-2 at Chelsea and the Hammers went down 2-1 at home to Bournemouth on Saturday. Arsenal's fixtures will start to get easier after having to face Man City and Chelsea in their first two games but as a result of their poor start to the season Unai Emery's men have drifted to [3.25] in the Top 4 Finish market. Some punters are less cool on West Ham climbing the table however, Manuel Pellegrini's men can now be backed at just [5.8] in the Relegation market after starting the season at around the [13.0] mark.